Each client's needs are different, so we come up with a unique approach for each of our client's objectives. Read about our responses to specific clients' needs. For examples of our work, see our portfolio. PMI Pros works with over a dozen malls needing assistance with dwindling numbers of shoppers. They are challenged with maintaining a large property with shrinking maintenance budgets and cutting qualified staff. Reduced operating budgets leave malls with no budgets for critical marketing efforts to keep them afloat. The PMI Pros Affiliate Program was developed as a way for malls to become a PMI Pros affiliate and earn needed marketing dollars which can be applied as credits to promote malls. Many local stores in these malls lack professional marketing and expect the mall management to handle their marketing for them. Chains always provide additional marketing materials and national advertising campaigns, but local businesses that replace them fail to grasp the importance of marketing their business. PMI Pros provides all the assistance necessary to build a successful and profitable business by assisting each store starting with a basic marketing plan. Armed with this information, we create engaging websites and a social media presence along with traditional marketing materials which increases their audience. AMI Cardiac, a heart monitoring services firm, needed HIPPA compliant protection on transferring patient information from PDF forms. PMI Pros encrypts the data before it transmits directly from the downloaded form. The website required a makeover for HIPPA compliancy and ease of use. A rebranding of the company was in order with a logo that migrated elements to a more contemporary look. Softer colors and bolder type helped achieve this goal. New sales sheets, folders, business cards and various other collateral was redesigned. The AMI website was redesigned to improve security and eliminate the risks of data breach, maintaining HIPPA compliancy. We split the site from the integration to a patient sensitive area so that HIPPA risks were removed from the setups. Stronger messaging was added prominently on the website to focus on the services provided. The challenge was to rebrand a successful speakers bureau that needed to upgrade their look and add new features to stay competitive in the markeplace. Our first task was to develop a logo that could represent the company in a professional manner, could work for web and print, and could attract new speakers. We added a new database for their speakers, making it both quicker and more intuitive so that visitors could search for specific speakers and/or categories. To maximize the probability that someone searching would respond, we added readily available response forms and made the page display similar speakers. We were also able to keep their existing site up while we developed the new one so that when we switched, we were able to maintain rankings with Google, Bing, and other search engine. This regional outdoor outfitter chain in upstate New York asked us to take over their website development as it was unprofessional and did not reflect the quality of the brands they sold. PMI Pros worked closely with their creative director to develop the overall look. Since it is a brand-oriented retailer, we came up with a rotating logo slideshow to showcase the countless brands each department page featured. Initially, they thought they needed to cram all the logos on the page, which would have cluttered the design presented to us. The site was designed to allow their staff to enter new content easily for the seasonal products. We increased traffic from under 100 visitors per day to 600 visitors per day and up to 3,000 a day during the peak holiday season. We installed a flipping book that converted their weekly newspaper inserts into a virtual book to help increase the daily traffic. The website traffic skyrocketed every week the flipping book was published on the site. A premier, world-renowned private golf community located in West Central Florida was rated the best private golf community in Florida by Golfweek magazine for years. They hosted tournaments, weddings, proms and various local events and club championships. The clubhouse needed a strategic plan and our wide range of marketing services. This unique community needed the works: logos, menus for the country club, direct response campaigns, booklets, a coffee table book, website development, and more. PMI Pros started by developing a name for the clubhouse; Horizons was chosen as it sits on top of one of the highest points in Florida. PMI Pros developed a museum-quality presentation with 6 glassed-in exhibit cases in the foyer of the clubhouse with one featuring a US open championship trophy won by a resident. Custom designed wall plaques were created for the various men and women champions to finish out the hall of champions. To showcase the 45 championship holes and Black Diamond's history to prospective buyers, we created a spectacular 250-page coffee table style book with breath-taking images we shot from a helicopter. The club needed a 24-page booklet that the managers could use to pitch weddings and banquets. The booklet won a Florida Printing award for its design. A direct response campaign was developed to sell non-equity memberships with the goal of converting them to home owners. Personalized e-mails were sent inviting past guests to visit their own personal webpage using PURLs. It tracked every landing page they visited and rewarded those who reached the end with a poster of the 15th in the Quarry. Ther 30% response rate was phenomenal with over 400 responding. Star Asset Recovery is a national medical and electronics recycling and inventory management company. It assists companies and organizations with buying and selling equipment and managing inventories. PMI Pros developed a logo to reflect recycling of electronics for the company's collateral materials, corporate ID, website, and inventory management system. The customized inventory system is hosted online in the cloud, which will eventually be linked to the website for customers to access. It was designed to be mobile responsive with an app for iPads and iPhones. It also feeds directly out through a direct to web feature for a limited amount of users. The system is expandable, allowing clients to directly access their inventories from any location to keep track of warranties, depreciation, and recycled parts and equipment. 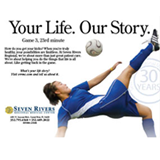 A private hospital marketing department was looking for an image campaign for the community. They wanted a unique lifestyle campaign to reach a varied demographic. PMI Pros worked hand in hand with the executive committee at the hospital to develop the concept. The “Your Life, Our Story” campaign was born. We selected individuals from the community participating in activities they were passionate about to achieve unique lifestyle imagery. These models were chosen by their activity as well as their age group. A woodcarver, a bell ringer, a swimmer, a bird watcher, a soccer player, and a bicyclist were portrayed on billboards, ads, banners, internal signage and collateral, and their website. The community responded positively to the campaign since the imagery was unique and the models were individuals they recognized from their own community.